Adds alternative recipes to the Nuka-mixer station to craft all Nuka-Cola's and Vim's with Caps. Optional: Adds missing mixer stations to the workshop crafting menu and smaller versions. 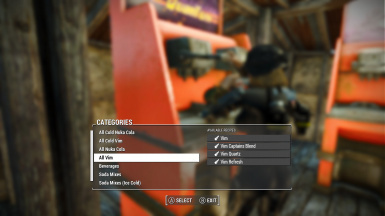 Settlers maintain Nuka-mixer station's so they will accept caps as well as the normal ingredients. Crafts All Nuka-Cola's and Vim's, both room temperature and ice cold. Cap price is the base value plus 30 percent. Ice cold versions are the base value plus 40 percent. Alternate version includes other drinks to the Nuka-mixer station. 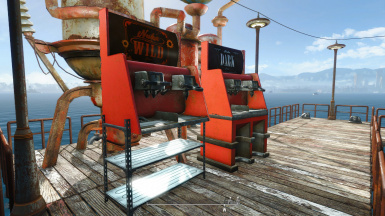 Alternate version includes other drinks to the Nuka-mixer station as well as the Chemistry station. 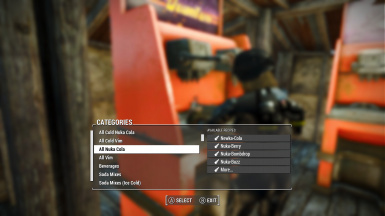 Optional ESP that adds missing mixer stations to the workshop crafting menu. Adds freestanding Dark, Grape and Wild. Also adds seven mixers that are for countertops. These smaller versions have no back so you may want to place them against something. All are small ESP's that can be merged into your other batch mods.